Volunteer in a fun, exciting retail environment where all the proceeds help families achieve the strength, stability and self-reliance they need to build a better life for themselves and their families. 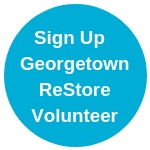 Court-ordered community service hours can only be completed at our ReStores (minimum 4 hour commitment). If you have a probation or parole officer in Williamson County, you must contact the Adult Probation Department, 512-943-3550, to be assigned to volunteer at the Habitat for Humanity of Williamson County ReStores.